Artists and scientists rearrange the environment to the advantage of society. Moreover, we find that all the arts and sciences have moved along an evolutionary path whose milestones are Form, Structure, and Place. In fact, man’s total development as a sentient being can be said to follow from initial concerns with Form or surface appearances, to an examination of the Structure of forms, and finally to a desire to comprehend the totality of relationships between forms, that is, Places. Since it generally is thought that art represents the avant-garde of human insight, it is interesting to note that science itself has evolved through Form, Structure, and Place appreciably in advance of the arts. The conception of the principle of the atom by the Epicureans in Greece approximately 2,000 years ago began that stage of science chiefly concerned with Form, which included the contributions of Euclid, Descartes, Copernicus, and Kepler. The Structural phase of science might be epitomized by Newton and Clerk Maxwell, although we must leap forward in time and include Rutherford and Bohr, who found a structural model for the atom in the planetary system. The stage of science that I’ve designated as Place is represented by Einstein and Max Planck, and has to do with space/time, synergy, and entropy, all of which subsume both Form and Structure. If further evidence is desired, one need only examine the technology of the respective scientific eras. As Bronowski has pointed out, a characteristic invention of the Scientific Revolution was the telescope, which Galileo demonstrated in 1609, a tool for perceiving form. A characteristic invention of the Industrial Revolution was the power machine to perform the routine work of the human muscle, thus a structural tool. And the characteristic invention of the Cybernetic Revolution into which we are moving is the digital computer, which does the routine work of the human brain: the cerebral realm is the “Place” in which all experience resides. It is interesting to note that the terms economy, ecumenical, and ecology share a common Greek root: oikos, a house. Following a period of Karmic Illusions (pre-Space Age history), the Renaissance Man emerges from his cocoon with difficulty (the generation gap) to find himself the master of a whole house and attendant guest cottage (the moon), and with nothing to do – the Leisure Problem. So the artist, not the politician, finally is accepted as the true legislator of mankind. Today’s artists work empirically with problems of leisure and decision-making. Men like Robert Rauschenberg, Robert Morris, and Robert Whitman are concerned more with the personal responsibility of their audience than with creating objects to be “owned,” since ownership is seen as an irresponsible concept when the obvious need is for global synergy. So we see that Duchamp’s penetrating description of art as “defined by context and completed by the spectator’s response” anticipated the present symbiosis of artist and ecologist. 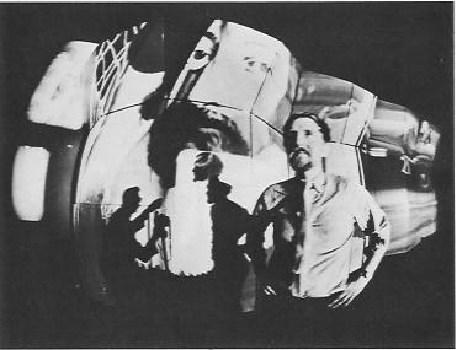 That description also anticipated the burgeoning of intermedia art as one of the most significant developments of twentieth-century society. Buckminster Fuller has differentiated mind from brain by demonstrating that the brain performs “special case” functions on individual, discrete bits of information, whereas mind is concerned with “general case” metaphysical relationships and implications. In our discussion of intermedia art I intend to present the general case. This approach begins with the word itself: I might have used mixed media, certainly a more common and identifiable term; but an environment in which the organisms are merely mixed is not the same as an environment whose elements are suffused in metamorphosis. Implicit in this trend is another facet of the new Romantic Age. The new consciousness doesn’t want to dream its fantasies, it wants to live them. The child of the Paleocybernetic Age intuits that his life could be a process of nonordinary realities if the energies of the globe were properly distributed. We’re developing all these fabulous hardware systems that soon will make life a process of continual myth-generation for the individual as well as the collective ego. “We’re just fooling around on the outer edges of our own sensibilities,” says Stan VanDerBeek. Unconsciously we’re developing memory storage and transfer systems that deal with millions of thoughts simultaneously. Sooner than we think we’ll be communicating on very high psychic levels of neurological referencing. It’s becoming extremely rich. This business of being artist in residence at some corporation is only part of the story; what we really want to be is artist in residence of the world, but we don’t know where to apply. Major internationalizing by artists is going to become very important, and so will the myth-making process. What we’re looking for in some sociologically appropriate way is a third side to each confrontation: a way to deal with each other through a medium. All media, like the automobile and telephone, are essentially a third party which relates us to whatever else it is we’re doing. I think the student riots are a manifestation of a deep-seated awareness of this problem. There’s such a contagiousness now with rioting; I think we realize that rarely do we directly deal with issues, personally, physically, intimately, with real body contact. That could easily be the cause, or at least partial cause, of the riots. We suddenly realize that riots may be the only real form of theatre left in which we’re not just an audience. 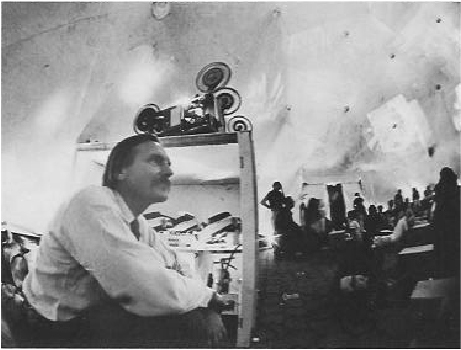 Stan VanDerBeek presides over intermedia presentation at his Movie Drome in Stony Point, N.Y. Photo: Bob Hanson. But, you see, being an audience is necessary. A major factor in living in an overpopulated world is that we really cannot deal with each other directly. As the Japanese do, for example. They’ve spent thousands of years cultivating this idea that they’re there but they’re not there. Because they’ve been jammed together for a long time, they’ve learned how to do it. Now our culture is moving in that direction also. That’s one reason for all these transfer systems – photo-reality, mock-reality, artificial intelligence, whatever term you choose – are spontaneously and unconsciously evolving. It’s a tremendous urgent unconscious need to realize that we can’t really see each other face to face. We only see each other through the subconsciousness of some other system. Cybernetics and the looping-around of the man/machine synergy are what we’ve been after all along. Who knows, but certainly for the last thousand years man has been inching toward that point, and now we’re running full speed. And, of course, the machines we’re running toward can trip us up as easily as not. We really can’t be certain. But movies are the ultimate illusionistic system. I’m working more and more with tools that show it can go far beyond its present form. Holograms obviously are a key direction to go into: where things are stored on a molecular level.